We are all familiar with SWOT and PEST as strategic analysis tools. Many will be less familiar with the Strategic Position & ACtion Evaluation matrix, frequently referred to as SPACE Matrix tool. The SWOT and PEST tools are both environment (internal and external) analysis tools. PEST takes us through a process that scrutinizes the external environment within which the organization has got to plan and operate.The four factors Political, Economic, Social and Technical will all to a greater or lesser extent impact the organization. The PEST analysis helps to get clarity around these factors that will impact the planning horizon and get consensus among the members of the planning team. SWOT analysis focuses on Strengths, Weaknesses, Opportunities and Threats. It helps to identify and clarify the strengths and weaknesses of the organizations as it seeks to develop a strategy and plan that can pursue and exploit the identified Opportunities while taking due cognizance of identified Threats, all within the external environment identified by the PEST analysis. SWOT and PEST analysis templates for Excel, Word and PowerPoint are available atThe Business Tools Store. Our Strategic Planning Workbook can be used to facilitate and record the PEST and SWOT analysis outcomes. The SPACE matrix takes a slightly different approach to the analysis. It is used to determine what type of strategy a company should undertake. It focuses on strategy formulation especially as related to the competitive position of an organization. The outcome of the analysis is plotted and the result depicted in one of the four quadrants to suggest the appropriate strategy. Financial Strength (FS): This internal dimension can include return on investment, leverage, liquidity, capital, risk involved in business etc. as key factors. Competitive Advantage (CA): This internal dimension can include market share, product quality, product life cycles etc. as key factors. Industry Strength (IS): This external dimension can include growth and profit potential, financial stability, technological know-how etc. as key factors. Environmental Stability (ES): This external dimension can include technological change, rate of inflation, demand variability, price range of competing products etc. as key factors. 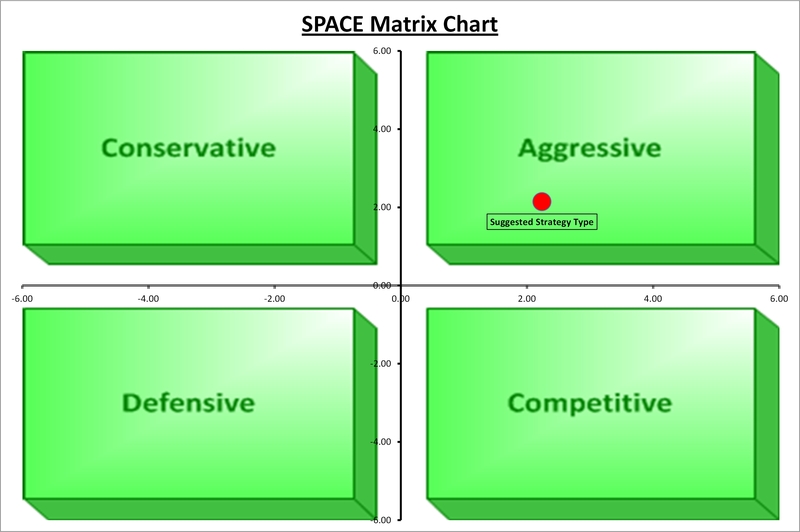 The SPACE matrix can be a useful initial analysis to identify a generic strategy. It can also be useful in assessing strategic alternatives suggested by the PEST or SWOT analysis. A SPACE Matrix template is available for Excel in the The Business Tools Store. We set ourselves the highest standards in customer service and go the extra mile when necessary to ensure we have a satisfied customer. So it is really pleasing when we get a thank you message and genuine appreciation from our customers. He couldn’t find our email with the download link. As it was out of hours we picked the message up on a cell phone while having dinner with friends. On checked back we confirmed that the order had been received early in the week and an automatic email with the appropriate download link had been generated and sent to Tom. The most appropriate action was to generate the email again and to suggest to Tom that if he didn’t receive it to check his SPAM folder or other possible locations where it might be hiding. Despite exhaustive searches he couldn’t find it, so time for plan B; we downloaded the files and user guide and sent them as an email attachment. Excel has always been a very popular and powerful business tool. One of the features of Excel that is easy to use and is frequently under-utilized is the Excel Bubble chart. The power of the Bubble chart is that it allows us to present data analysis in three dimensions and can be significantly more informative than visually trying to aggregate multiple two-dimensional charts in the mind’s eye. By way of example, we are all familiar with customer surveys where we ask our customers to rate our performance under a number of headings such as quality, customer service, etc. The results are usually informative and useful. We can add a second dimension by asking to customer to also rate the factors in terms of their importance to him/her. By plotting the data in two dimensions we can now see how our performance is rated for the factors that are most important, are therefore most significant, to the customer. Asking the customer to rate you on how you compare to competitors and other suppliers provides an additional insight into how to interpret the ratings he/she had given you. For most of us the goal would be to be rated very highly for those factors that are most important to the customer and to be perceived to be much better than our competitors. An Excel Bubble chart allows you to analyse the results in 3D; the X-axis being used for the rating you receive for the factor, Y-axis for the rating of the importance of the factor and the size of the Bubble indicating how you compare with the competition. A low X value, a high Y value and a small Bubble spells trouble and indicates that you have a lot of work to do on this factor as you are rating as being poor for a factor that the customer considers important and you are perceived to be much worse that your competitors. A “picture being worth a 1,000 words” the chart allows us to quickly hone in on the factors where we need to make improvement most urgently. There are many other examples where a Bubble chart can prove useful. In the case of a SWOT analysis the X-axis might indicate the size of the SWOT factor (Strength, Weakness, etc.) the Y-axis indicating the immediate or short-term importance/impact of the factor and the Bubble size indicating the more long-term strategic importance/impact of the factor. 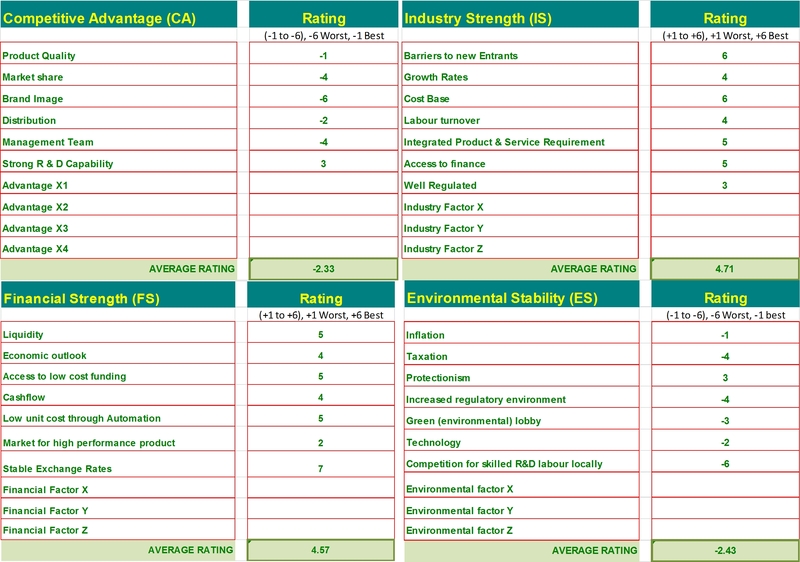 The SWOT analysis example can be seen on the Business Tools Store together with other examples for Ansoff matrix, Boston Consulting Group (BCG) chart and GE/McKinsey 9-cell matrix. Online sales continue to account for a growing proportion of total sales. Even the smallest business can no longer ignore the online channel. The online channel offers opportunities for every type of business and with ecommerce platforms like Big Commerce** it was never easier or more affordable to open an online store. Once you have an online sales presence, channel revenue maximisation becomes a key objective. Three key variables impact the total revenue from the channel. Should you focus on increasing the total number of visitors or seek to increase the conversion rate, say, by 20% or increase the average order value by,say, 10%? Each requires a different strategy and results in a different revenue outcome. Our Ecommerce Revenue Business Model Calculator lets you do “what-if” revenue analysis on these key variables for each of four periods. Revenue, traffic and conversion rate projections are calculated and displayed in tabular format and in a graphic dashboard. ** Big Commerce is used by over 39,000 small business online store worldwide and costs as little as $25 per month. Continuing to expand our extensive portfolio of strategic planning tools we have recently added an Excel SPACE Matrix template. To start using it to produce your SPACE Matrix just click on SPACE Matrix Excel template. Is the SPACE matrix tool for you? of an organization and helps companies to decide the appropriate type of strategy analysis the company should undertake. The SPACE matrix analysis outcome can be used as a basis for other analyses, such as PEST analysis, SWOT analysis, Ansoff, BCG matrix or GE-McKinsey models, for which we have a comprehensive portfolio of Strategic Planning templates. The SPACE matrix has four quadrants. Each quadrant suggests a different type of strategy and the SPACE analysis places the organisation in one of the quadrants indicating the type of strategy the company should undertake. The SPACE Matrix analysis framework has four dimensions in order to determine the organization's strategic positioning in the industry. The FS score is added to the ES score to give the total Y-axis score. This point of intersection is then plotted on an SPACE matrix and the resulting quadrant location indicated the appropriate strategy. 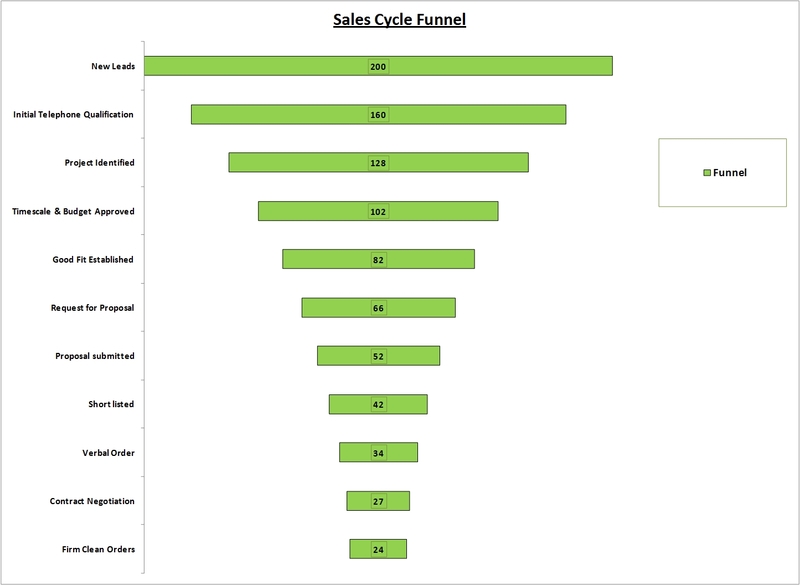 The Sales Pipeline Funnel Calculator has been upgraded to include a graphic image that dynamically shows the shape of the funnel that results from the sales process pipeline being used. The graphic shows how the number of active leads in the funnel decrease as they flow through the funnel. This allows the user to quickly see the impact of any changes in the parameters defining the funnel, i.e. the number of leads entering the funnel, the number of stages in the sales process and the leakage in the funnnel as one goes from one stage to the next. The new template is available to download from Sales-Funnel-Template | Sales-Pipeline-Template-Excel-Calculator.